Back in sedate St Albans it wasn’t uncommon to pull up behind the odd Ferrari or Maserati at the traffic lights, but since we moved to Canada it’s been all Mustangs, pick-up trucks and Harley’s. Once the stuff of notable occasion, now the throaty roar of a Harley Davidson is part of the auditory landscape, just as fire hydrants are part of the physical one. Even after three years we still get a thrill from actually living all the stuff we’d only ever seen in the movies. So when my neighbour offered to take the kids for a spin around the block, there was no way we were passing THAT opportunity up! J and T both confessed afterwards that they were a little scared, (‘especially’ J said, ‘when we turned left or right and I had to lean in’) but kudos to them both, they hopped on unhesitatingly. S, naturally, isn’t phased by anything and looked as though she’d been doing this all her life. I think we all felt something powerful today. Thanks Wanda and Kevin for the memories (and photos) that’ll stay with us for life. 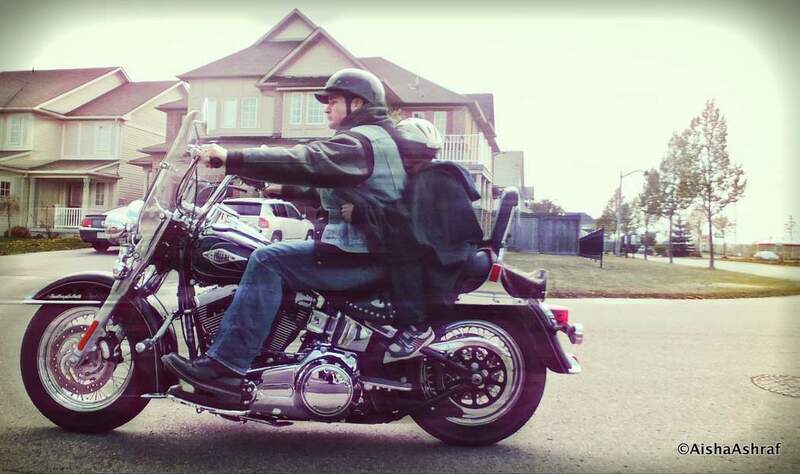 We’re a Harley family and LOVE it! I am planning to get my motorcycle endorsement this summer! !